Flexible knit wrist fits securely, locks out debris and dirt while providing a secure fit. 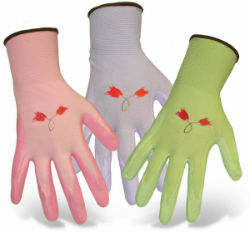 Helps keep hands warm by preventing air from getting inside or escaping. Conveniently fits under clothing sleeves. Flexible nylon shell provides a close fit. Nitrile coated palm provides excellent protection Superior tactile sensitivity and grip.